The most economical, interesting and cool (air-conditioned!) way of traveling around Ibiza. Hiring a car or scooter is not always easy in Ibiza, especially if you're young and trying to save money. The Ibiza bus service is an efficient and economical alternative to get you to the beach, the clubs and the towns, whilst saving yourself some money to spend elsewhere. During the summer months, the buses run frequently around the island; normally beginning at 7:00 and ending between 22:00 and 23:30, depending on the line, before the disco buses take over from midnight until the early hours of the morning. Buses run, on average, every 30 minutes, or 15 minutes on the busier lines such as line 3 from San Antonio to Eivissa. 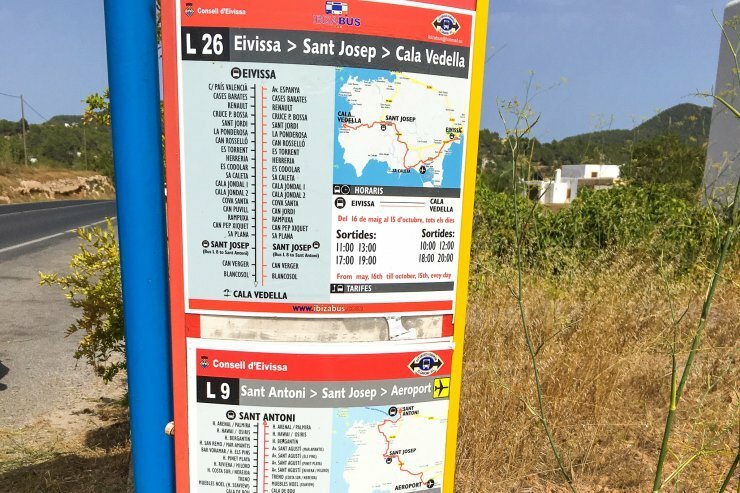 On the quieter secondary lines, for instance lines 2 (San Antonio - San Antonio Bay), 8 (San Antonio - San José - Ibiza) and 24 (Airport - Santa Eulalia - Es Caná), the buses only run hourly. The fun-filled disco bus then begins after the clock strikes 12 midnight, transporting clubbers around the island to whatever destination they desire, although this can still be used as a normal bus by visitors and non-clubbers who also want to stay out a little later. For the complete around the clock timetable, check out Ibiza Bus Company's website but Google Maps can also be useful. Read our guide to the disco buses here. The names of the stops are often not noticeable, and only some stops have solar-powered display boards for the forthcoming buses, so it's best to either wait at your nearest stop or consult the Bus Company's website for greater accuracy. There's a large free carpark behind IKEA (parking Es Gorg, see Google maps, ) near the Pacha roundabout, with a free bus running from the stop every 15 minutes into Ibiza town centre (line 50, between 9.00 - 14.15 h and 17 - 21.15 h). Unfortunately, it isn't signposted, so will cease if not enough people use this fantastic service, so please take advantage (especially with the prices for parking in Ibiza Town). Worried about whether a bus can take you to where you want to be? Well fear not, because the three major bus stations - Ibiza Town (signposted "Eivissa" in catalán), San Antonio (Sant Antoni) and Santa Eulalia (Santa Eularia) - all have connecting routes and 99% of destinations on the island can be reached from one of these stations, often with a short walk from the stop. And due to the frequency of buses, you can maximise your time in Ibiza to ensure you experience anything that takes your fancy and enrich your Mediterranean adventure. Tickets prices are very affordable, with a single coming in at no more than €3 and return at, on average, €4:50. Tickets are normally available onboard the bus, especially for the busier lines, but occasionally you may have to buy tickets at the office beforehand so make sure you check with the ticket office for the situation on your line. Not only are the buses cheap to use but they offer a very pleasant experience. Comfortable seats and air conditioning makes for an enjoyable change to the scorching midday sun during the summer. They nearly always run on time, thanks to the drivers who won't wait for dawdlers to ensure you get to your destination with excellent punctuality! Finally, why not look at the buses as a chance for integration with the local people who make your exotic experience such a paradise? Try out your Spanish and let them try out their English rather than surrounding yourself with your natives. Ask them to recommend a restaurant, bar or club so that you get the local insight and can make the most on your time in Ibiza. The opportunities offered the bus know no bounds!